A 35-year old woman presented with progressive cognitive decline and pyramidal signs for 2 years. 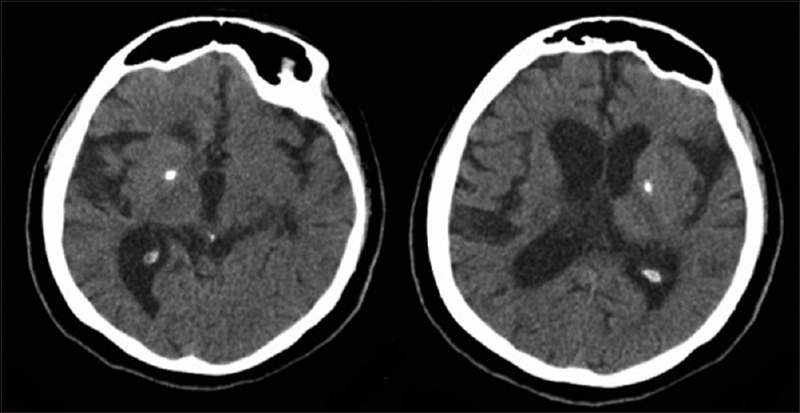 The patient's brain computed tomography scan showed bilateral calcifications in the basal ganglia [Figure 1], and brain magnetic resonance imaging revealed periventricular white-matter hyperintensities, cortical atrophy, and thinning of the corpus callosum [Figure 2]. The patient did not have any bone cysts. T66M homozygous mutation in the TREM2 gene was detected, confirming the diagnosis of Nasu–Hakola disease (NHD). Chouery E, Delague V, Bergougnoux A, Koussa S, Serre JL, Mégarbané A. Mutations in TREM2 lead to pure early-onset dementia without bone cysts. Hum Mutat 2008;29:E194-204. Le Ber I, De Septenville A, Guerreiro R, Bras J6, Camuzat A, Caroppo P, et al. Homozygous TREM2 mutation in a family with atypical frontotemporal dementia. Neurobiol Aging 2014;35:2419.e23-5.